When shopping for a mortgage you will probably call a couple of online lenders and large banks. And you should. These companies specialize in mortgages. 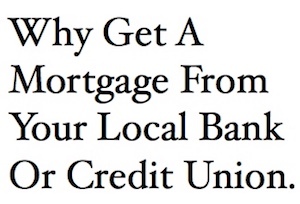 But what about your local bank or credit union? They do mortgages to. A lot of people forget to call them even though they have a checking and savings account with them amounts other things. If your local bank is a big bank than this really won’t help. I’m talking about those small regional banks. What I am going to do here is describe the pros and cons of getting a mortgage with your credit union or a small local bank. Risky Mortgages – Small banks and credit unions do not write them as they cannot afford the risk on you foreclosing. Its more peace of mind knowing you will not be sold into a bad loan. Making Payments – Your small local bank and credit union will more than likely hold onto the mortgage note instead of selling it like large mortgage companies. The bank and credit union need to collect the interest from your payments to keep the revenues coming in. This means all your finances are in the same place. Lower Rates – The small local bank might not be able to offer lower rates but a credit union may. When I was a mortgage banker I would lose almost every potential sale when a person told me they were talking to their credit union also. Reason being is the credit union would rather offer .125% – .25% lower to keep your business in-house and they can do it. A Credit Union by definition is a place where individuals pool their money together and a management team watches that money instead of having to borrow from a larger company. What this does is let each other borrow money for a mortgage at a lower rate than what the market is offering. The Credit Union pools all of its members money together to make the loan and holds onto the mortgage note making a nice return for the Credit Union. Redoing Loans – If times get tough your local bank or credit union can work with you to redo your loan. Or at least allow you to make partial payments. Since it’s a local bank or credit union its apart of the community. Whats good for the community is good for the local bank. Salary Paid – Most people who work at the local bank or credit union get paid a salary and do not work on commission. This means they have no incentive to pressure you into a mortgage. I’m sure they get paid a small commission but they are not like mortgage brokers that are 100% commission. Fees – In some cases you’ll see the processing fees are lower to do a mortgage with smaller banks and credit unions. Supporting The Community – Even though your local bank is probably owned by a larger holding company you would be supporting local jobs and job creation. The bank will earn interest on your loan which will let them offer favorable interest rates to small business owners. Urgency – Credit Unions and small local banks are not known for their speed in closing loans. The process is known to take longer than large mortgage companies. Availability – Small banks and credit unions have typical 9 to 5 hours making it hard to get ahold of your loan officer. Not so with large mortgage companies. When I was a mortgage banker at Quicken Loans I was able to work 24 hours a day if I wanted. Clients had my cell phone and could call me anytime for an update. Getting a mortgage from your local bank or credit union has its advantages. And the biggest reason in most cases is you will be able to get a lower interest rate. At the same time you have to ask yourself if .125% is worth it if they are not going to be able to close the loan as fast as a large mortgage company.